We’ve been working for months, and finally CraftEdu.com has launched! Its an online class site offering the finest professional instructors (me included!) for all kinds of media. One of the trickiest issues we bead artists deal with is the play of light and color on different finishes of glass. Glass beads are the grandest of visual tricksters. The smaller the bead, the trickier the tricks. Color changes radically based on the light source, surrounding beads, thread, background, bead finish, and other factors. 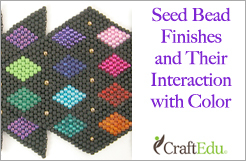 I’ve developed a 2-part online class at CraftEdu.com called “Seed Bead Finishes and Their Interaction with Color.” In the class I explain major groups of finishes (opaque, transparent, matte, silver-lined, ceylon, and more) and we explore how much light they reflect, and how much color they transmit. If you can grasp that, you’ll be able to make much more conscious choices in finishes and color. I also outline problems we encounter with certain finishes, and things to be aware of. If you are confused about how light and color work with different finishes, you’ll love this class. Stop by for a FREE preview. Seed Beads: Is There Anything They Can’t Do?